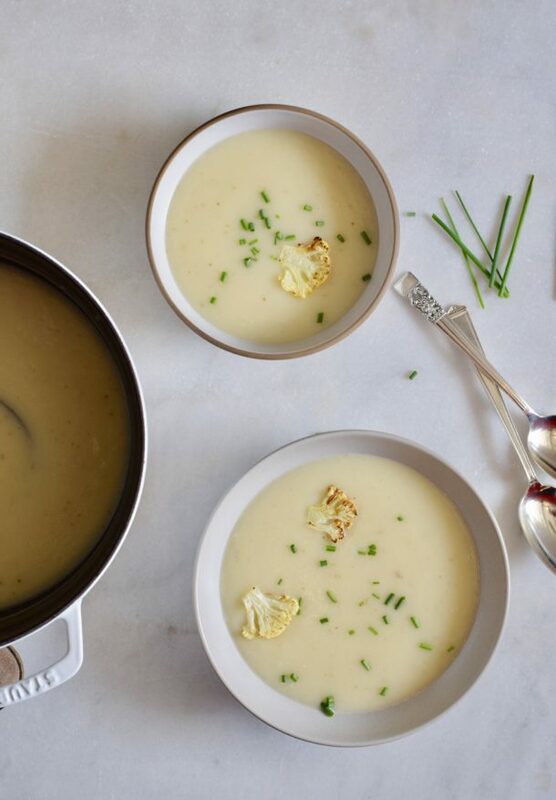 Who wouldn’t love a soup that is sophisticated enough to serve at a dinner party, but simple enough to make on a weeknight? I know I would! It’s amazing what happens when you blend cauliflower and a few ho-hum potatoes and give them a big boost from a whole head of roasted garlic. Utter creamy deliciousness, and not just by my standards. Mr. Picky gave me a fabulous back-handed compliment when he tried this soup, “this tastes like French fries!” To set the record straight, this soup does not taste like French fries, but I why would I argue? There aren’t too many white foods that I am gung-ho about, but cauliflower happens to be one of them. So it’s missing some chloropyhll. That’s nothing to get worked up about when there’s so much more going for it. Since Mr. Picky really likes broccoli, we called cauliflower “white broccoli” for many years. That isn’t much of a stretch since both are members of the cruciferous family of vegetables which include cabbage, brussels sprouts, collards and bok choy, too. These vegetables are known for their powerful anti-cancer properties and it is recommended that you regularly include them in your diet. This soup is just one delicious way to do that. One of the reasons I love cauliflower is for its versatility. My favorite way to eat it is tossed with coconut oil and a sprinkle of sea salt and roasted until it’s sweet and golden. I couldn’t resist adding a few crispy baby florets as a garnish on this bowl of soup here, but really, you can have so much fun with toppings. You can go fancy with some truffle oil or shaved Parmigiano. Or you can go in a homey direction with a grilled cheese sandwich cut into croutons. This soup seems very elegant and earthy at the same time, which is why I think you can get away with not peeling the potatoes. Why give up all the fiber and nutrients right under the skin just so you can have a perfectly smooth soup? Sure when you puree the soup, you’ll be left with a few small flecks of peel here and there, but I’ve never been one to get hung up on things like that. My strategy is usually to get the garlic in the oven right away and while it roasts, start prepping the vegetables. 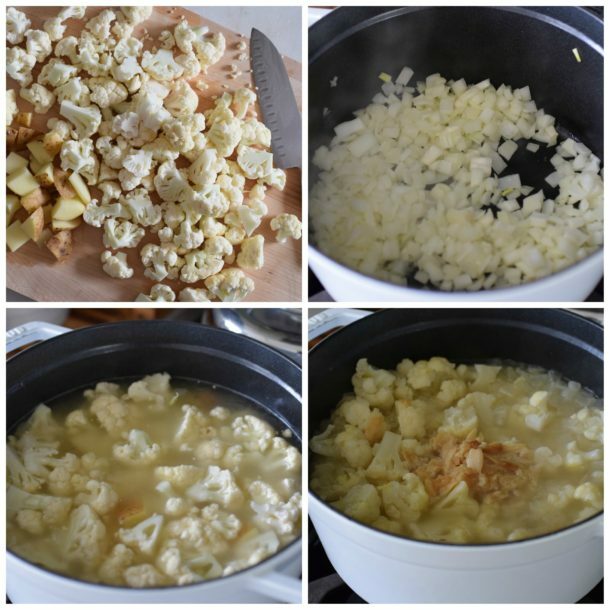 By the time you finish simmering the cauliflower for 20 minutes, the garlic is ready to be squeezed into the pot. 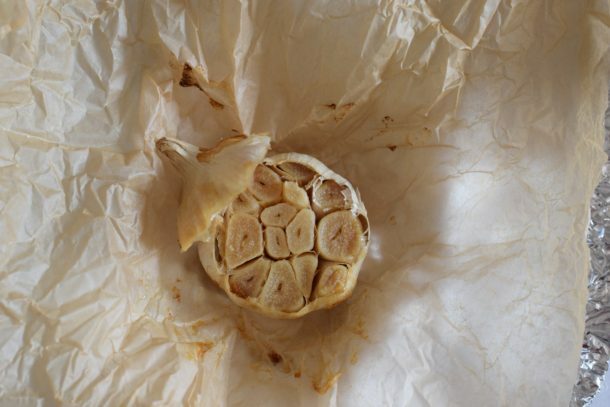 To save maximum time, roast your garlic a few days in advance and keep it refrigerated. Prep your onions and cauliflower and keep them refrigerated in airtight containers in the fridge. The potatoes will only take a minute to chop. You can make this a day or two ahead if you like, but it will thicken slightly as it sits. The next day, add some cooked white beans to your child’s thermos and pour the hot soup right on top for a well balanced school lunch. In a large pot over medium heat, melt the butter. Add the onion and sauté, covered, until tender and translucent, about 6 minutes. Stir occasionally. Pour the wine over the onions and simmer uncovered until the wine has been reduced slightly, about 2-4 minutes. Add the cauliflower, potato, stock and salt. Bring to a boil over high heat and then lower to a simmer. Cook partially covered until potatoes and cauliflower are tender, about 20 minutes. Unwrap the garlic and squeeze the soft garlic directly into the pot. Discard the papery skins. Cook for another 5 minutes. Puree soup in the pot with an immersion blender or in batches in a blender. It is important that you taste for seasoning since all stocks have different levels of sodium. Add extra salt if you need it. I am reading about what wines to use with different foods (i.e. meats, veg’s, sauce’s). For vegetables it says Sauvignon Blanc and for sauces & gravy it says Chardonnay. I am curious what type of wine you choose to use in this recipe? Thank you!! Would this soup work dairy free? If so, what would you substitute for the butter? Thanks! You can use all olive oil or sub a good quality vegan butter like Miyoko’s Kitchen. This recipe is amazing!!! I use my own homemade chicken broth and follow the rest of the recipe exactly…and wow, its a hit everytime!!! Thanks so much Pamela! Thanks, Marlena. Homemade chicken broth is everything! LOVING this recipe. Easy, versatile, and healthy—this stuff is like winning the lottery! I advocate using a good, thick bone stock: all that gelatin makes for an amazing, silky body. I’ve been using chicken bone stock, but hope soon to try it with lamb/mutton bones and am curious about what the finish might be like with fish stock. Every time I make a batch, I end up guzzling two mugfuls as soon as it’s done. Thanks so much for sharing this. I, too, am a huge fan of bone broth. It makes every soup tastes so rich! I love this soup, It’s so easy to make and so delicious with parmesan cheese! I made this for my family and they all loved it! I roasted the garlic and cut up the cauliflower the night before and the whole thing came together in a jiff! I made this soup for my family for dinner for the first time last night. Not only was it quick, easy, filling, and nutritious, but all 5 of us (including a usually “selective” 10 year old eater) loved it! And, in a true testament to the power of a good dinner, 2 of my 3 kids took it in a thermos for lunch today too! This will definitely become a regular part of the rotation in my house. “Selective” — great word. I need to use that. More importantly, hooray for a successful new dish! What a true delight! Your recipe is absolutely delicious. I doubled the garlic not for any other reason than, I’m Italian. I also used water instead of wine but not because I’m Italian. Thank you for sharing this wonderful addition to the world of amazing cuisine. 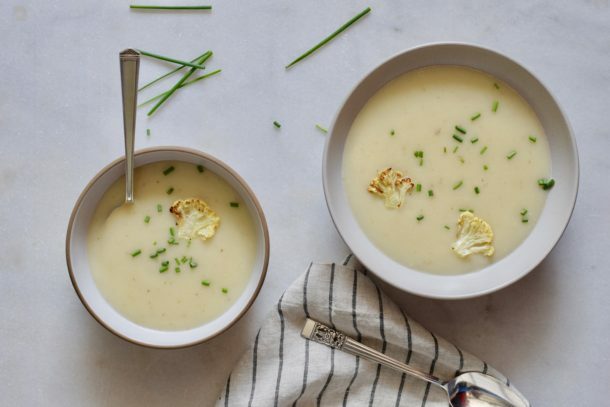 I made your cauliflower and roasted garlic soup today, and it was fabulous…so rich (without cream)and such a wonderful blend of simple ingredients! I also added a bit of smoked paprika (not the taste of French fries, but flavorful nevertheless). Sounds delicious! Thanks for the feedback. Wonderful soup. Creamy but light. Elegant but supereasy to make. I sprinkled tiny bits of cilandro -because I was out of Parmigiano- and it was delicious for lunch. I have a lot left over and I was wondering if it freezes well, otherwise I will pig out on cauliflower soup this weekend. Haha! 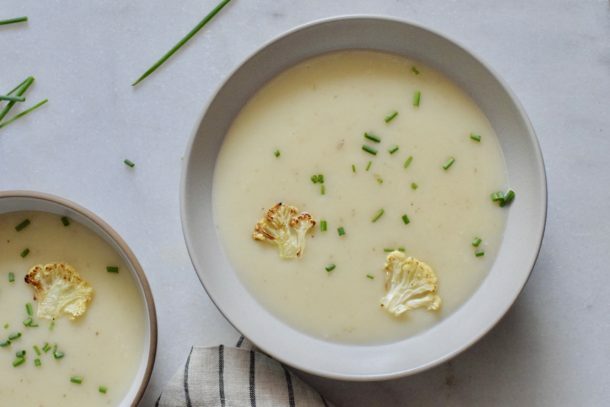 Not that anyone could “pig out” on cauliflower soup since it’s just cauliflower! I’m sure it would freeze well. Just keep it in a tightly covered container and store for no more than 3 months. I love this soup so much I decided to try to do a broccoli version of it. I prefer the coliflower but the broccoli was also very good. I have made this soup with broccoli, and I agree — very good, but I prefer the cauliflower version. I wasn’t thrilled with the color of the broccoli soup, but otherwise I liked it just fine. I served the cauliflower soup to our guests as the first course of a dinner. They all thought it contained cream! It was really hearty but elegant at the same time. I sprinkled chives over it but I think I shall try chopped fresh rosemary the next time (and there will be a next time! )since rosemary pairs so well with potatoes. What a great way to eat your veggies! Thanks! Isn’t it great, the creaminess without the cream?? To be honest, most of the time that I make the soup, I don’t even garnish it with anything. I think it’s yummy just the way it is. Since cauliflower is one of our favourite veggies (and not because it tastes like French fries! 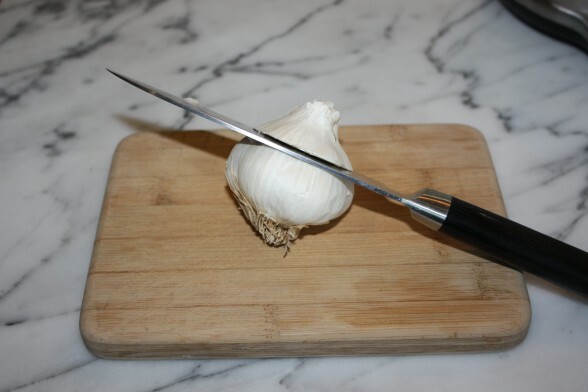 ), and garlic a constant presence in all our cooking, I shall be happy to try this recipe. Thank you! Fantastic! Please report back when you do!